This table shows the inserts that are available for the various tools that we sell. In some cases you have a choice of high speed steel or carbide inserts. 3577 1/32" (0.031") Groover 0"
3578 1/16" (0.062") Groover 0"
What's So Good About High Speed Steel? High Speed Steel is noted for its ability to perform at slow surface speeds, while providing a good surface finish, without chipping or breaking. 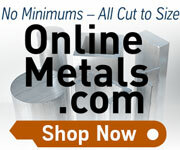 High speed steel offers reliable toughness. It is commonly used in applications with interrupted cuts and it is notably tougher than carbide and ceramic materials. It also resists chipping in cutting applications. The toughness allows for steep positive cutting configurations to be generated. The positive cutting tool configurations demand less horsepower and will lower the level of heat generated during the operation when work hardening is a concern. High Speed Steel provides good wear resistance in both metal working and wood working applications. High speed steel cutting tools have a sharper cutting edge than carbide cutting tools. The work piece is cut rather than fractured which results in an improved surface finish. At the speeds and feeds that most of us home shop machinists use, high speed steel will provide a better surface finish than carbide inserts. In other words, you can do better work with high speed steel. For roughing cuts, use carbide. For finish cuts, use high speed steel. Because these tools are indexable, you can simply change the insert, and resume cutting at the same tool position. The picture below shows two pieces of steel. 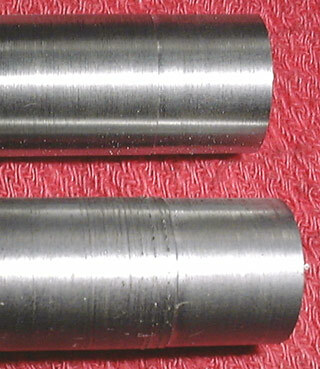 In each case, the left part of the turned area was done with a carbide insert. The right part was done with a high speed steel insert. The bottom bar is cold finished steel from a hardware store. This is one of the most difficult materials on which to get a good finish. The difference in finish between the two sides is quite apparent. The top bar is 12L14 steel. This is one of the easiest materials on which to get a good finish. The difference is not a marked, but is visible.